On September 13th, the House Financial Services Committee approved the Financial Choice Act (H.R. 5983), by a vote of 30 to 26 – largely along party lines. 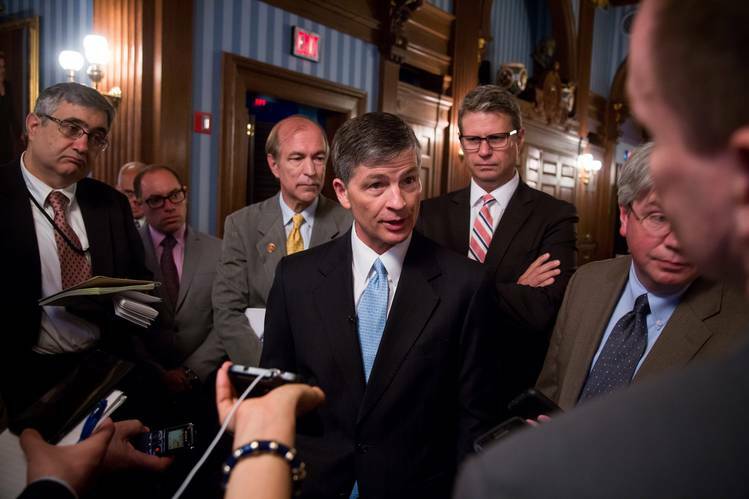 The bill, sponsored by Rep. Jeb Hensarling [R, TX-5], aims to promote economic growth by deregulating the financial sector and scaling back the Dodd-Frank Wall Street Reform and Consumer Protection Act. Following the Great Depression, the Glass-Steagall Act was enacted in 1933. The Glass-Steagall Act banned commercial banks from dealing securities and prohibited investment banks from accepting deposits – essentially separating commercial and investment banks to protect consumers from risky investments and prevent future economic crises. Under President Bill Clinton, the Gramm-Leach-Bliley Act of 1999 deregulated the financial market and modified the Glass-Steagall Act, allowing well-capitalized commercial banks and non-bank financial entities to affiliate under financial holding companies. It is often cited as a cause of the 2008 financial collapse. Since President Barack Obama signed the Dodd-Frank Act into law, several legislators have proposed changes. The latest being Rep. Hensarling’s proposal to dismantle Dodd-Frank and replace it with a plan to deregulate the financial market. What’s Next for the Financial Choice Act? The legislation will be sent to the House floor for a vote, but is suspected to fail. While the bill may not be adopted this year, it is expected to set the tone for future financial reform legislation after the November election. Aside from Hensarling’s proposal, several other bills that would modify Dodd-Frank have previously been introduced this Congress. The 21st Century Glass-Steagall Act (S. 1709): Sponsored by Sen. Elizabeth Warren [D, MA], this bipartisan bill seeks to reinstate the Glass-Steagall Act by fully separating commercial and investment banks. 21st Century Glass-Steagall Act of 2015 (H.R. 3054) : Sponsored by Rep. Michael Capuano [D, MA-7], this bipartisan bill also seeks to reinstate the Glass-Steagall Act, with measures to separate commercial and investment banks. Repealing Dodd-Frank Wall Street Reform (H.R. 171): Sponsored by Rep. Adrian Smith [R, NE-3], this bill seeks to abolish the Dodd-Frank Act and return financial regulation to that predating the 2010 bill. Promoting Job Creation and Reducing Small Business Burdens Act (H.R. 37): Sponsored by Rep. Michael Fitzpatrick [R, PA-8], this bill amends the Commodity Exchange act to exempt those that are not financial entities or meets specific, government clearing requirements from restrictions on swap participants. Providing for Consideration of the bill H.R. 37 (H.Res. 27): Sponsored by Rep. Pete Sessions [R, TX-32], this bill makes technical corrections to Dodd-Frank to enhance ability of small companies to access capital through public and private markets. Eliminating the Bureau of Consumer Financial Protection (H.R. 3118): Sponsored by Rep. John Ratcliffe [R, TX-4], this bill cuts the consumer watchdog and restores law to that before the Consumer Financial Protection Act of 2010 was enacted. To Repeal Titles I and II of the Dodd-Frank Wall Street Reform and Consumer Protection Act (H.R. 2094): Sponsored by Rep. Lynn Westmoreland [R, GA-3], this bill removes Dodd Frank’s Financial Stability provision (which allowed the Fed’s Board of Governors to supervise nonbank financial companies that were judged as being too linked to the banking market and causing systemic risk) and Orderly Liquidation provision (which allowed the FDIC to quickly liquidate large financial companies that are about to fail. To Repeal Title II of the Dodd-Frank Wall Street Reform and Consumer Protection Act (H.R. 4894): Sponsored by Rep. Lynn Westmoreland [R, GA-3], this bill eliminates the Orderly Liquidation provision of Dodd-Frank. Return to Prudent Banking Act of 2015 (H.R. 381): Sponsored by Rep. Marcy Kaptur [D, OH-9], this bipartisan bill amends the Federal Deposit Insurance Act to prohibit insured depository institutions from being an affiliate of brokers and dealers. It also expands prohibition against the transaction of banking activities by securities firms. Wall Street Accountability through Sustainable Funding Act (H.R. 2474): Sponsored by Rep. Rosa DeLauro [D, CT-3], this bill amends the Commodity Exchange Act to require the Commodity Futures Trading Commission (CFTC) to impose fees to recover the cost of the appropriations to the CFTC for the fiscal year. To Amend the Dodd-Frank Wall Street Reform and Consumer Protection Act (H.R. 4210): Sponsored by Rep. Robert Pittenger [R, NC-9], this bill amends Dodd-Frank to require each voting member of the FSOC to testify at least twice each year before the House Financial Services Committee and the Senate Banking, Housing, and Urban Affairs Committee.